In the long run, the most important factor shifting the AS curve is productivity growth. Productivity means how much output can be produced with a given quantity of labor. One measure of this is output per worker or GDP per capita. Over time, productivity grows so that the same quantity of labor can produce more output. Historically, the real growth in GDP per capita in an advanced economy like the United States has averaged about 2% to 3% per year, but productivity growth has been faster during certain extended periods like the 1960s and the late 1990s through the early 2000s, or slower during periods like the 1970s. A higher level of productivity shifts the AS curve to the right, because with improved productivity, firms can produce a greater quantity of output at every price level. Figure 1 (a) shows an outward shift in productivity over two time periods. 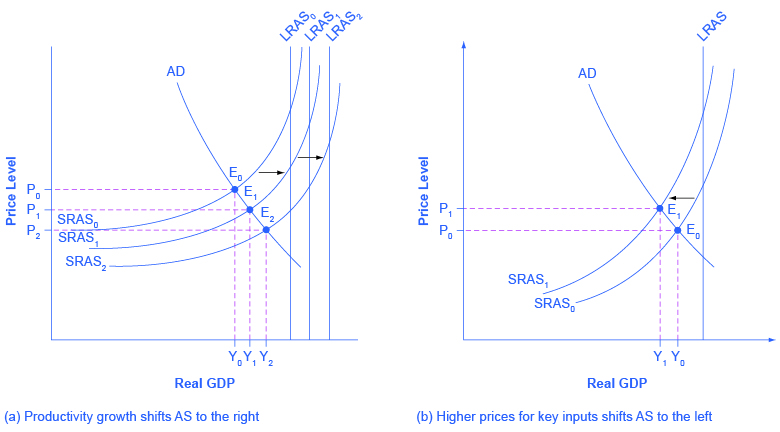 The AS curve shifts out from SRAS0 to SRAS1 to SRAS2, reflecting the rise in potential GDP in this economy, and the equilibrium shifts from E0 to E1 to E2. Figure 1. Shifts in Aggregate Supply. (a) The rise in productivity causes the SRAS curve to shift to the right. The original equilibrium E0 is at the intersection of AD and SRAS0. When SRAS shifts right, then the new equilibrium E1 is at the intersection of AD and SRAS1, and then yet another equilibrium, E2, is at the intersection of AD and SRAS2. Shifts in SRAS to the right, lead to a greater level of output and to downward pressure on the price level. (b) A higher price for inputs means that at any given price level for outputs, a lower quantity will be produced so aggregate supply will shift to the left from SRAS0 to AS1. The new equilibrium, E1, has a reduced quantity of output and a higher price level than the original equilibrium (E0). Higher prices for inputs that are widely used across the entire economy can have a macroeconomic impact on aggregate supply. Examples of such widely used inputs include wages and energy products. Increases in the price of such inputs will cause the SRAS curve to shift to the left, which means that at each given price level for outputs, a higher price for inputs will discourage production because it will reduce the possibilities for earning profits. Figure 1 (b) shows the aggregate supply curve shifting to the left, from SRAS0 to SRAS1, causing the equilibrium to move from E0 to E1. The movement from the original equilibrium of E0 to the new equilibrium of E1 will bring a nasty set of effects: reduced GDP or recession, higher unemployment because the economy is now further away from potential GDP, and an inflationary higher price level as well. For example, the U.S. economy experienced recessions in 1974–1975, 1980–1982, 1990–91, 2001, and 2007–2009 that were each preceded or accompanied by a rise in the key input of oil prices. In the 1970s, this pattern of a shift to the left in SRAS leading to a stagnant economy with high unemployment and inflation was nicknamed stagflation. Conversely, a decline in the price of a key input like oil will shift the SRAS curve to the right, providing an incentive for more to be produced at every given price level for outputs. From 1985 to 1986, for example, the average price of crude oil fell by almost half, from $24 a barrel to $12 a barrel. Similarly, from 1997 to 1998, the price of a barrel of crude oil dropped from $17 per barrel to $11 per barrel. In both cases, the plummeting price of oil led to a situation like that presented earlier in Figure 1 (a), where the outward shift of SRAS to the right allowed the economy to expand, unemployment to fall, and inflation to decline. Suppose the U.S. Congress passes significant immigration reform that makes it easier for foreigners to come to the United States to work. Use the AD/AS model to explain how this would affect the equilibrium level of GDP and the price level. Suppose concerns about the size of the federal budget deficit lead the U.S. Congress to cut all funding for research and development for ten years. Assuming this has an impact on technology growth, what does the AD/AS model predict would be the likely effect on equilibrium GDP and the price level? Name some factors that could cause the SRAS curve to shift, and say whether they would shift SRAS to the right or to the left. Will the shift of SRAS to the right tend to make the equilibrium quantity and price level higher or lower? What about a shift of SRAS to the left? If new government regulations require firms to use a cleaner technology that is also less efficient than what was previously used, what would the effect be on output, the price level, and employment using the AD/AS diagram? During the spring of 2016 the Midwestern United States, which has a large agricultural base, experiences above-average rainfall. Using the AD/AS diagram, what is the effect on output, the price level, and employment? Hydraulic fracturing (fracking) has the potential to significantly increase the amount of natural gas produced in the United States. If a large percentage of factories and utility companies use natural gas, what will happen to output, the price level, and employment as fracking becomes more widely used? Some politicians have suggested tying the minimum wage to the consumer price index (CPI). Using the AD/AS diagram, what effects would this policy most likely have on output, the price level, and employment? Immigration reform as described should increase the labor supply, shifting SRAS to the right, leading to a higher equilibrium GDP and a lower price level. Given the assumptions made here, the cuts in R&D funding should reduce productivity growth. The model would show this as a leftward shift in the SRAS curve, leading to a lower equilibrium GDP and a higher price level. 24.3 Shifts in Aggregate Supply by Rice University is licensed under a Creative Commons Attribution 4.0 International License, except where otherwise noted.